England's most northerly ground, the home of Durham County Cricket Club, will host three fixtures. First established in 1995, The Riverside Durham has previously hosted four ICC Cricket World Cup fixtures, all of which took place at the 1999 edition. 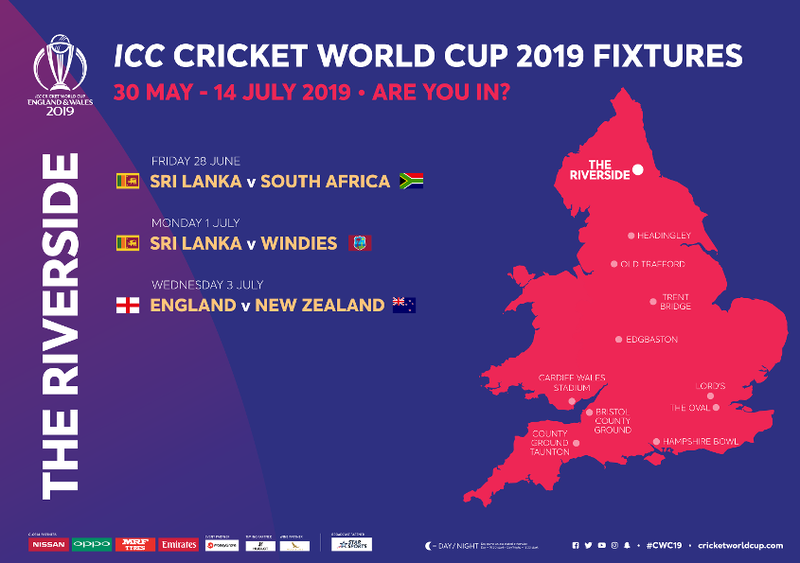 At the ICC Cricket World Cup 2019, Durham will host three fixtures, including England v New Zealand and it will be the home for two Sri Lanka games. The highest World Cup total at the home of Durham County Cricket Club is 261/6, which was scored by Pakistan on their way to victory against Scotland in 1999. However, the stars of the show that day were the bowling attack of Wasim Akram, Shoaib Akhtar and Abdul Razzaq who took three wickets apiece. To find out more about the accessible facilities and services at The Riverside Durham, check out the CWC19 Access Guide here. Plan ahead so you can make the most out of your day at The Riverside Durham during the ICC Men’s Cricket World Cup 2019. The Riverside Durham is located just one mile outside Chester-le-Street, four miles outside Durham and ten miles from Newcastle upon Tyne. There are plenty of public transport options as well as a Park & Ride service and pre-bookable parking at the venue. Walking and cycling are good choices for those staying close by. There are two parking areas available for spectators at The Riverside Durham: Yellow and Red car park. All parking permits must be pre-booked and are sold on a first-come, first-served basis. Permits will not be available to purchase on the day. Booking information will be available soon. Both car parks are a short walk from the ground and will be controlled by stewards on the match day. There is a dedicated section for blue badge holders in the Red car park directly adjacent to ground - approximately 50m to the Gate 3 entrance. Blue badge parking must be pre-booked here. Parking can now be booked through Durham Cricket's website here. Rainton Meadows Arena (post code: DH4 5PH) is the dedicated Park & Ride site. The car park will open with shuttles running to The Riverside Durham three hours prior to the start of the match. The return service will resume 30 minutes before close of play. The shuttle journey will be payable on the day (contactless payment will be accepted). You do not need to book in advance. All shuttle buses will be accessible. The majority of the public transport buses in Durham are accessible and will continue to service the venue. Chester-le-Street station operates regular services from local and regional destinations including Newcastle, Liverpool, Middlesbrough, and Sunderland. It is the closest station to the ground - approximately 20-minute walk. The East Coast services from Edinburgh and London are unable to call at Chester-le-Street therefore the nearest stop for East Coast trains is Durham Station. There is a shuttle bus service operating from the station for all CWC19 matches. The shuttle bus service will start at Durham Train Station three hours prior to the start of the match and a return service will commence 30 minutes before the last ball or at the abandonment of the match. The shuttle service is paid for on the bus on the day and contactless payment will be accepted. You do not need to book in advance. All shuttle buses will be accessible. The Riverside Durham has designated and clearly signposted drop-off and pick-up points for all cars and taxis/private hire/Uber located just off Ropery Lane, next to the Riverside Park. An area map with detailed car parks will be available soon. There is a signposted walking route from Chester-le-Street town centre, bus stops and Chester-le-Street railway station which will take approximately 20 minutes (one mile). There will be World Cup Cricketeers along the route to help answer any questions and guide you to the ground. Cycle racks are also available free of charge at the venue. Stewards at the gate will direct any cyclists wishing to use these on the day. Durham, in North East England, is a county with breathtaking dales, a dramatic coastline, a vale steeped in history and a vibrant city at its heart. Chester-le-Street, home to The Riverside Durham, has a history that reaches back through the centuries. Visit St Mary and St Cuthbert’s Church, a place of worship since 883AD, discover the town’s fascinating past as you walk the heritage trail, or simply enjoy the surroundings on a walk in Riverside Park with its riverside path, gardens, wildlife area and children’s activities. 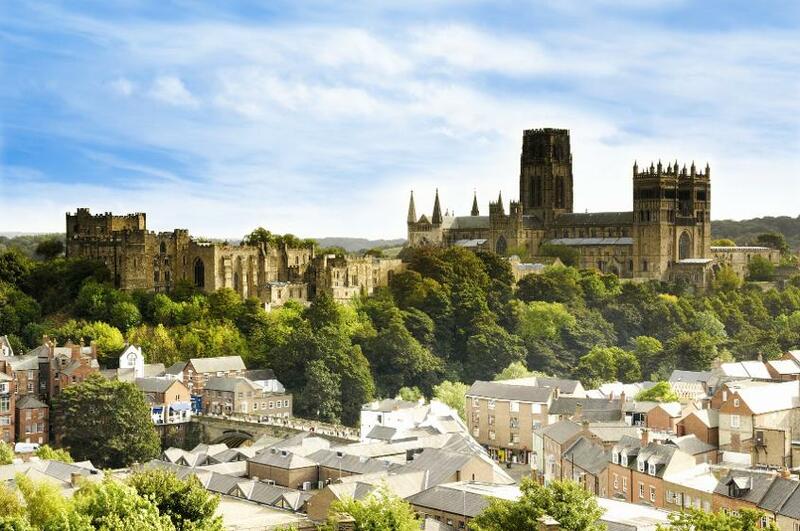 Boasting one of the most stunning city skylines in Europe, Durham City captivates with its characterful streets and prominent peninsula crowned with the towering sight of Durham Castle and Durham Cathedral, which together form a UNESCO World Heritage Site. Two of the county’s treasure troves can be found in the Durham Dales. Raby, one of England’s finest medieval castles, houses stunning interiors, fine artwork and furniture; whilst The Bowes Museum showcases one of the most important collections of European fine and decorative arts in the North of England. For a journey through 2,000 years of history, myth and legend, the UK’s ‘must see’ live-action show Kynren - An Epic Tale of England is spectacular family entertainment for all ages. And 2019 sees the fruition of Auckland Castle’s exciting redevelopment as the breathtaking building, a significant part of English history, reopens to become an attraction not to be missed. As day turns to night, Durham’s skies light up as the North Pennines AONB is home to more nationally recognised Dark Sky Discovery Sites than any other part of the UK. Or for stars of a different kind, head to Gala for a packed programme of entertainment.